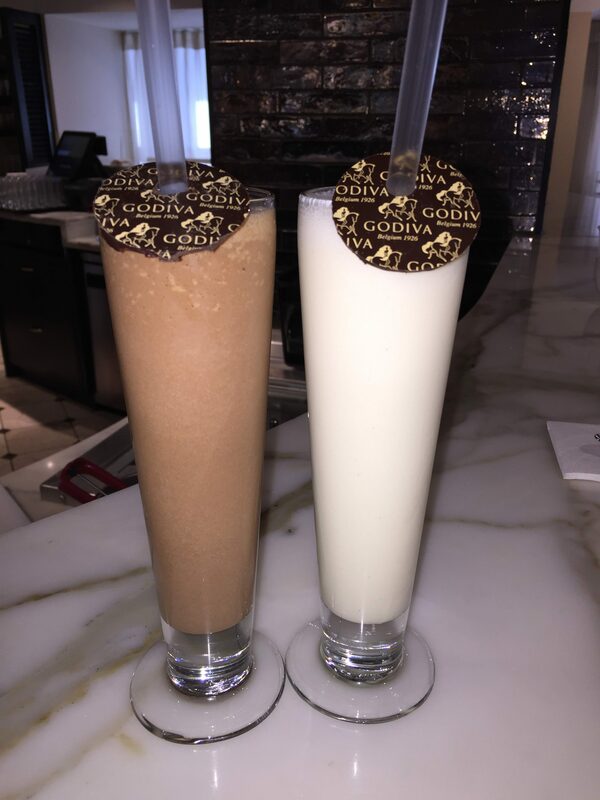 Godiva chocolate cafe is tucked away on the 4th Floor of Harrods north side. We were advised to go there by My (Lees’) mum and sister who came over to visit from Australia a few years ago. Got there and wasn’t sure why but it was dead, I mean we were the only two people in there. We will explain why later on, but was took a seat at the bar and looked at the menu. Straight away I was blown away by the prices they were charging, milkshakes for £7.00 or ice cream milkshakes for £7.50. We were on holiday and needed to have a cold drink after the near 30oc. I have a milk chocolate milkshake and Tina has a white chocolate ice cream milkshake. All of a sudden the chap making the milkshakes came over and said sorry we do not have any whipped cream is that ok, I will top up your glass with more milkshake instead. We certainly didn’t mind that. Oh actually god, I have never had a milkshake like it. It was thick and was just like chilled melted chocolate. Along with the the little disc of dark chocolate was heaven in a glass. Then having tried Tina’s I was regretting not having an ice cream one (was informed that all ice cream was made onsite, so you will not get the same ice cream anywhere in the world). Then out of nowhere, the waiter who served us brought over a selection of 4 truffles. We had no idea what they were but he later informed us that they were his favourite ones. They must have been the best as he would know surely! The truffles alone should have cost in excess of £8.00 just for those 4!